I have to admit that, although I would love to be one of those mums who manages to look after 3 children, work full time hours and keep a house that looks like a show home - I am most certainly not! Life is pretty chaotic around here and something has to give, for me - that something is the house! Don't get me wrong, we don't live in squalor (as long as you don't open the door to the "playroom" or room of doom as I call it...) but the house is not our priority when it comes to time or money spent - I think the fact that we lived in a rented house means we're less inclined to spend a lot of money on it, as it's not really ours to "do up" and there are so many aspects of it that we wouldn't personally choose. We don't currently have any concrete plans to buy in the immediate future, but that doesn't stop me from fantasising about the kind of home I would want should we ever decide to take the plunge. Although I love the size that comes with older houses such as the one we currently live in, I definitely prefer new builds purely for their clean lines and contemporary feel - my dream home would be airy and open plan, minimalist and full of lots of modern gadgets designed to make life easier. 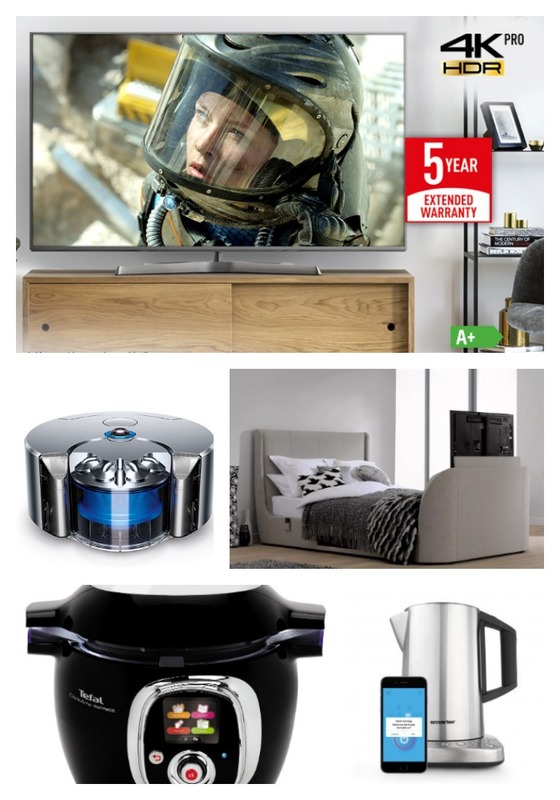 I thought I'd share some of my favourite modern life gadgets that I would definitely love to have in my dream High-Tech Home! 1) A State Of The Art TV - An ultra modern, top of the line TV would definitely be top of my list for a high-tech home. My Netflix binge watches would be so much more entertaining when enjoyed on a 72" screen in the comfort of my own living room, there are some fantastic ones available in the Panasonic 4K TV Range that I have my eye on which feature a Studio Master HCX Processor and Professional Cinema Display to deliver out of this world colour clarity, contrast and brightness. Consider me sold! 2) A Hidden TV Bed - I have coveted these ever since I first saw them! We don't have a TV in our bedroom because I feel like it's impossible for them to not look unsightly, I don't know what it is I just never think TV's look quite right in a bedroom setting - but given the chance to own one of these beds with a hidden TV I would definitely go for it! 3)A robot vacuum - Is there anything better than the idea of a vacuum that sends itself around your house all day hoovering up?! And now you can even control them from an app so you can be on your way home from work and set your vacuum to clean up the floor before you set foot through the door. TAKE MY MONEY!! 4) A Tefal Cook4Me - I can't remember how I ever managed life without my slow cooker, and so I can only imagine that is exactly how I would feel about having something as fabulous as the Tefal Cook4Me in my life - this little beauty can cook all manner of delicious dishes with minimal human involvement, which sounds just perfect to me! 5) An iKettle - I'll admit, when I first heard about these - I wasn't entirely sold on the idea. I mean, who needs to be able to control a kettle from their phone?! How lazy are we?! But then I thought about it more - and I realised how cool it would actually be to be able to time your kettle to switch itself on at precisely the right moment each morning so that you can make your coffee just when you need it. And how much handier that device would be for making up baby bottles in the evening during night feeds too. And I was sold! Which high-tech items would you love to own? I'd love to hear what would be on your own wishlist!